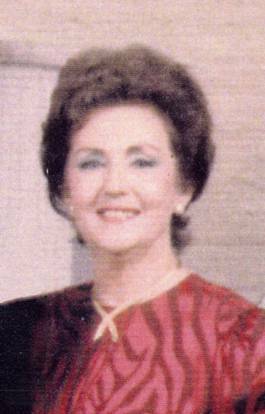 Jo Muriel Alford Roberts, affectionately known to family and friends as Jody passed away on Sunday, November 19, 1995. Mrs. Roberts was born on October 8, 1925 in Houston, Texas. In 1946, she received her Registered Nurse certificate from St. Mary’s Hospital at Port Arthur, Texas. She served as a Red Cross volunteer from 1968 until 1995, receiving the Clara Barton award, the highest ward given to a volunteer. She also received the Golden Triangle Award from the Commodore Longfellow Society, reflecting her work with the Red Cross. Survivors include her husband, C.O. [Clarence Orval] (Bobby) Roberts; son, Michael; daughter, Rebecca Jo; three grandchildren, Christopher, Stefanie and Kayla. Friends may call after 4:00 p.m. on Tuesday at, Geo. H. Lewis & Sons, 1010 Bering Drive, where the family will be present from 5:00 p.m. until 7:00 p.m. for visitation. Funeral services will be held at 10:00 a.m. on Wednesday, November 22, 1995 from the chapel of Geo. H. Lewis & Sons. Graveside Services will follow at 12:30 p.m. at Cook Cemetery in Liberty, Texas. Serving as pallbearers will be Bruce Stratton, George Burns, C.P. Loucks, Ray Jennings, John Townley and Dr. Richard Kercheval. In lieu of flowers, please make memorial contributions to the American Red Cross or the Commodore Longfellow Society, P.O. Box 190, Whitewright, Texas 75491. AAFA NOTES: SSDI records confirm the birth and death (_____Nov 1995) dates of Jo Muriel Roberts (SS# issued in TX), last residence Houston, Harris Co., TX. We included the obituaries of her mother, Thelma Mildred Farris Alford Brewer; stepmother Mary Elsie May Alford; and brother Raymond Newton Alford in Texas Obituaries; and of her father, Raymond Guy Alford, in Alabama Obituaries. Jody joined AAFA just six weeks before her death. She was the daughter of Raymond Guy Alford and his first wife, Thelma Mildred Farris. Her lineage: Jo Muriel 1925 TX1, Raymond Guy 1901 AL2, James Thomas 1873 AL3, Jacob Wesley 1847 AL4, Leven Ellis 1814 GA5, William 1787 VA6, William 1741 VA7, Salvator 1716 VA8. Jo Muriel Alford Roberts, known to her family and friends as “Jody,” passed away of a massive stroke in Houston, Texas, on November 19, 1995. She devoted most of her adult life volunteering as a nurse. In 1946 she received her nursing certificate from St. Mary’s Hospital at Port Arthur, Texas. Her first real test came in 1947 during the Texas City explosion—she was among the first nurse volunteers to arrive and render aide. She gave years of service to the Liberty and Harris County Red Cross emergency disaster relief. Beginning in 1968 she was on the volunteer staff of 20 American Red Cross national Aquatic Schools as Nurse. It was always known that Jody would not report for work in the morning until she was dressed in the sparkling white of her uniform—even in the lakeside “rough” camps. She always had every hair in place and her makeup was perfect. Once a patient was turned over to Jody, all present could relax. She knew just what needed to be done and she put everyone present at ease with her professionalism. Among her most prized awards was the Golden Triangle Award from the Commodore Longfellow Society. The Society was organized in 1951, four years after the death of Wilbert E. Longfellow, with the objective of commemorating and perpetuating the memory of this pioneer in lifesaving, both in the water and on land. The means selected was an organization that recognized the followers of Longfellow who best epitomize his spirit of service to others and who were dedicated to carrying on the “crusade of saving lives.” In 1991, this national organization chose Jody as the only recipient for that year.